Jerusalem Artichoke is a wonderful root vegetable available around Europe and London.During our Recent chef consultancy project . we came up with this amazing Indian small sharing plate. 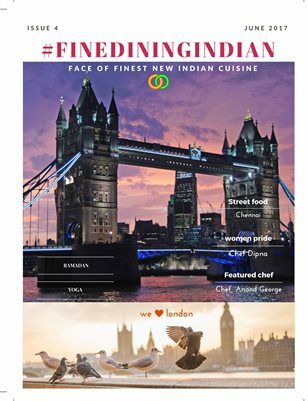 You can read More similar recipes In our Fine dining Indian food magazine.Chaat’s in Indian cuisine are a great Umami Rich content. Slice Jerusalem artichoke in o thin slice using Mandolin, keep in water mixed with lemon juice.Heat oil to fry and maintain temperature at 170c . drain and fry artichoke till its crispy. Drain to paper towel. Toss with chilli powder and salt, keep aside ,Beat yoghurt add pinch of sugar if its sour. In a bowl toss Jerusalem artichoke, (keep few pieces separate for garnish) with chopped onion, green chilli, coriander and chaat masala. Place the tossed mixture in two serving bowls, cover with yoghurt, line on top with mint and tamarind chutney, sprinkle pomegranate seeds. Place artichoke chips and sev crisp on top. Garnish with coriander cress, sprinkle chaat masala.